The ability to effectively address invasive species prevention, control, outreach, and research issues depends on the acquisition and efficient use of resources. Resources and shortfalls need to be better understood in order to determine key areas to invest effort and/or funding. Resources Working Group Chair: Justine W. Nihipali, Department of Business, Economic Development and Tourism. The HISC Resources Working Group is scheduled to meet from 8:30a-4:30p on Wednesday, August 1, 2018 in the DLNR Boardroom (ground floor, DH-Makai corner) of the Kalanimoku Building, 1151 Punchbowl Street, to review & make final recommendations on proposals & budget to the HISC for final approval at the next HISC meeting on Tuesday, August 14, from 1-3p. A WexEx meeting will be established with log-in information provided in the meeting notice no later than 48 hours prior to the meeting date/time. Two hour metered parking is available in the basement of the Kalanimoku Building. Three hour metered parking is available in the adjacent Frank F. Fasi Municipal Building parking lot off of Alapai and/or Beretania Streets. Limited street parking is also available on Punchbowl and King Streets. Goal 1: Organizational and resource shortfalls with respect to invasive species are identified and prioritized for each HISC agency. It is critical to identify the capacity shortfalls within HISC agencies. It will allow a clearer understanding of current vs. needed capacity and facilitate prioritization efforts for support of agencies to fulfill our kuleana with respect to invasive species as well as for support of other entities working in the state who fulfill vital roles. A better understanding of each agencies capacity and need will also allow for creative collaborative solutions and opportunities for increased cross-departmental collaboration. Identify roles, responsibilities, and priorities related to invasive species for each HISC agency. Identify roles, responsibilities, and priorities of other organizations working in the state on invasive species issues. Work directly with designated staff within each agency to identify current capacity and shortfalls. Use resources working group structure to provide a peer or external review process to assist agencies in identifying shortfalls. Include information from this process in HISC annual reports and legislative packages. Goal 2: Dedicated and sustained funding mechanisms and sources for prevention, control, outreach, and research and technology. Dedicated and sustained resources for invasive species work are necessary for the effective management of invasive species in Hawaii. To achieve meaningful long-term results, the state must recognize this as a priority issue to support in perpetuity, as inconsistent support results in piecemeal work and significant backslides in forward progress. To achieve our mission, resources must be available for ongoing prevention, emergency response, sustained control, effective outreach, and innovative research and technology. Identify all funds currently available for invasive species work, identify how they address core functions of invasive species management, and assist agencies and organizations in acquiring these funds. Identify opportunities for and assist the development of public private partnerships. Engage private funding organizations through the Hawaii Community Foundation and industry partners to be a part of the solution. Advise the governor and legislature on budgetary issues. Goal 3: Cost benefit analysis is available for prevention, early detection, and control of invasive species in Hawaii. Cost benefit analysis will provide science-based, quantitative analysis of the impacts of invasive species, both present and not present in Hawaii. Clearly articulating the costs and benefits of managing invasive species will support the need for sustaining this work, economically support use of the most efficient management actions, and provide decision based tools for setting management priorities, goals, and methods used. 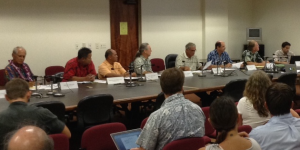 Request a new Legislative Reference Bureau study to estimate the total cost of implementing effective invasive species programs in Hawaii. Create a prioritized list of economic questions and analyses needed. Work with economists to determine data that are needed in models and create templates for data collection. Work with economists to do analyses. Act as a clearinghouse for data, economic analysis, and other related information. Level of funding received by agencies for invasive species work (funding level need vs. funding level met). Level of funding allocated and available for disbursement by the HISC. Number of new stakeholders engaged and resulting capacity support. Number of reports, studies, materials that cite HISC funded economic studies and data. November 20, 2015 – Agenda* | *Meeting cancelled due to lack of quorum.